Forget that second guess. The first one was better. Obviously this is not Munich (flat landscape there). Also not Bavaria. People wear costumes not only there in Germany. I thought that it was more bavarian type costumes. but doe the 2 flags it's somewhere at the borders of those 2 states? No border. The yellow-black flag is from the region (not Munich), the blue-white could be from the town, but that is not sure. At least it is similar. black/yellow is also used in Saksen-Anhalt. Good guess, you are on the right track. I'm orientate mostly at the bleu/ white flag. i found only one thus far with a armer shield on it. But had to start somewhere. No, it is not ravensburg. You should look more at the style of the building and the landscape to find out the right area. building or landscape says nothing to me. to rule aeria's out, is it a farm in the Black Forrest? I assume that the lovely reddish rocks holding the houses up is sandstone? Similar colour to Herefordshire here. Two correct guesses: It is in the Black Forest and the common stone there is in fact sandstone! And to give you a hint, todays purpose of the building has something to do with culinary experiences. But not sure of the location, except it is somewhere in the Black Forest. Yes you are right. This is the building, but what else are you able to find out about the location and the purpose of today and yesterday? Maybe some keyword you did use can put you and others on the right track?? No one continuing the puzzle? 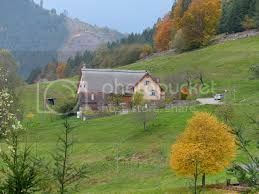 Ombugge has found another picture of the house, but he could not tell us the location. I will give you two other clues and maybe then it is possible to continue the search. It is a former farm house and the family living there for generations, was famous for her special knowledges, which was also sometimes spooky for people in the neighbourhood. Today it is fully restored and belongs to one of the most famous hotels and restaurants of Germany, which is very close to this place. I suspect that herbalism may come into this? Yes, that is correct! It has something to do with the history of the place and today's owner try to catch up and give you some idea with the food they offer. Is it anywhere near Gutach? This is really a very intriguing puzzle and I am very much led astray by seeing the photos of the glorious scenery. It all keeps reminding me of the lovely drive we had when you took me on that trip up, up and up in the Black Forest, Ralf. After some searching I think Gutach is out! Last edited by wherrygirl; March 11th, 2018, 00:07.